To explain why I wanted to give Dandy: Or a Brief Glimpse Into the Life of a Candy Alchemist ($3.99) a try once I saw it pop up on the App Store, I first need to talk a bit about the type of shoot ’em ups I enjoy. One of the few genres of games I’ve never cared much for is bullet-hell shoot ’em ups, those games where you fight a constant hail of fire while trying not to get a headache from all the blinking and flashing. The shoot ’em ups I enjoy are the slower ones, the kind that forces you to study your enemies and devise strategies on the go (like the PC game The Binding of Isaac for instance), and this is precisely the kind of gameplay Dandy offers. 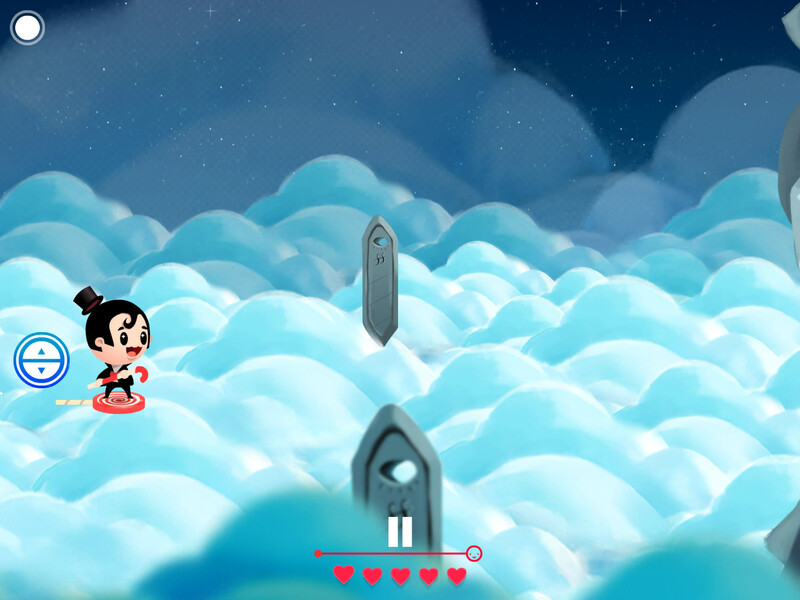 Playing as Dandy, a cute little alchemist, you traverse a beautifully-drawn 2D world to tackle a variety of enemies, each with its own specific behavior, as you try to get as far as you can before perishing. You’ll discover some very smart design decisions behind Dandy‘s gameplay that make it a challenging but thoroughly-entertaining shoot ’em up that rewards patience, strategizing, and skill without sacrificing speed. Dandy is, apparently, a candy alchemist, which is my kind of alchemist. The game’s webpage offers part of the game’s backstory, talking about how Dandy was the last in a dwindling line of candy alchemists who, obsessed with searching for alchemical ingredients, went mad during his journey into the ruins of an ancient world. When you play Dandy for the first time, you can sense that there’s a story behind this game, there’s an idea that was, probably, pretty well formed in the minds of the developers. Still, I wish they had shared some of it with the players at the beginning of the game, even as a quick cut-scene, so that Dandy’s whole journey felt more rooted with a better sense of purpose. At the same time, games like Dandy live and die on the strength of their gameplay, so the absence of a strong story doesn’t really affect the game’s entertainment value. However, I always feel that when a developer comes up with on original idea like being a candy alchemist, it doesn’t hurt to actually share it with the players. Yes, as the title says we do get only a brief glimpse into the life of the candy alchemist, but I do wish that glimpse was slightly less brief. Despite lacking narrative grounding, Dandy‘s gameplay makes it stand out, especially in the eyes of gamers like myself who want their shoot ’em ups dipped in some contemplation and strategizing. 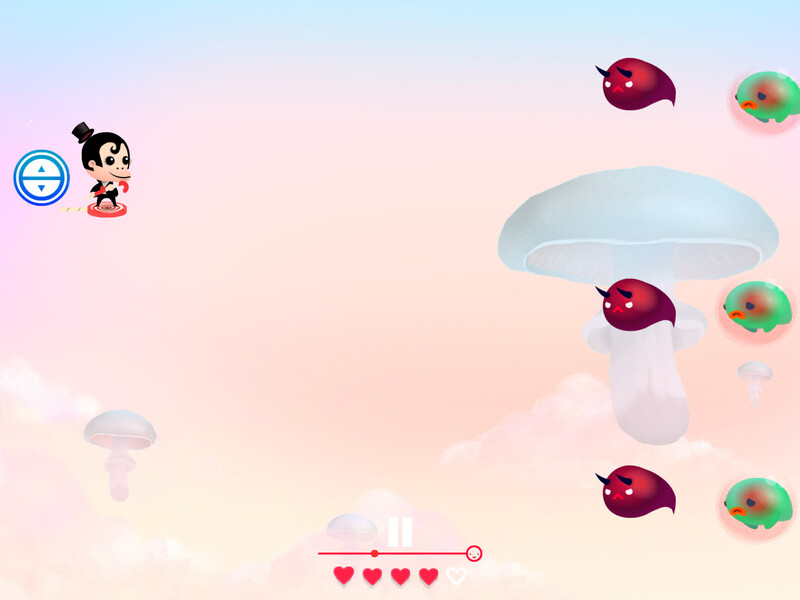 In the game you play as Dandy, a very fancily-dressed man (which is after all what “dandy" means), riding a flying lollipop to battle and shooting bullets from your candy cane wand. Yes, the game is that inventive. You fly through procedurally-generated levels, punctuated by little power-up stations in the form of candy dispenser statues, and fight endless waves of enemies. The smart design choices Wefiend made in this game start from the way Dandy shoots since the more bullets he shoots, the smaller, and less powerful, his bullets become. By adding this mechanic, the developers made sure that you can’t just go through the game shooting an endless stream of candy bullets at anything that appears on the right side of the screen; instead, you have to get into the rhythm of holding your fire when you can and deciding which enemies require few strong bullets or which ones you can take out with just a quick stream of weaker bullets. Speaking of enemies, Dandy has some of the cutest-yet-deadly enemies I’ve seen in a while. You’ve got little red Narwhals, plenty of spitting guys in mostly-rounded shapes (which makes them look all cuddly when they aren’t trying to kill you), little octopus guys protected by swirling half-moon shields, rotund bomb guys, and so on, all of them colorful, and all of them very nicely drawn. However, what makes them fun to play against isn’t their admittedly-cute looks but, rather, their behaviors that elevate the game from a basic shoot ’em up to a more strategic one. Some enemies attack only when disturbed, some will home in on you like darts, forcing you to shift up and down the screen constantly, others will jump in and out of the screen (either from above or below) and shoot at you, and so on. What makes all these enemies even more interesting is the way the developers have managed to build set-pieces into their side-scroller; occasionally, you’ll have enemies line up behind each other, the one closer to you being the kind that doesn’t shoot until you shoot it and the one in the back spouting bullets at you. What this means is that you are forced to go with a less-efficient strategy and shoot at the “peaceful" enemy, who immediately starts shooting back at you, in order to get to the one at the back. There are many moments like this one in Dandy where the way the game cleverly positions enemies in groups hinders the basic strategy of holding fire until you are fully charged-up and aren’t in danger of getting shot back. To help you tackle the never-ending waves of enemies, the game gives you a great number of power-ups, which can be combined at will. The different power-ups (cleverly presented in the shape of candy) change the way you play since some will make you smaller and more maneuvarable, others will make your bullets return to you like boomerangs, others will help your bullets stay stronger for longer, and so on. Part of the fun of the game is discovering these power-ups and trying to work out the best – or most fun – combos. You get these power-ups mostly from the candy dispenser statues, although if you’ve had a very difficult time surviving, you often have to ignore any power-ups for the sake of refilling your health. While I get how this choice of health versus power-ups makes sense in a roguelike as it increases the challenge, I sometimes wish I could get an automatic refill at these dispensers so I could always choose a power-up since they do make the game more fun to play. All the challenging gameplay Dandy offers is very nicely wrapped in colorful visuals and a great soundtrack, both of which elevate the quality of the game quite a bit. Character models are very nicely drawn, especially Mr. Dandy, and the background art, which changes often but, perhaps, not as often as I would like, really helps the foreground art pop out more and makes the game a pleasure to play. I do hope the background art was more linked to the story of the game, but even in a narrative vacuum, the procedurally generated levels are fun to play. The music fits the game as it stays pleasant throughout while still giving you enough rhythm so as not to get bored of hearing it playthrough after playthrough. The game not only looks nice but also plays nicely as the controls are pretty spot on. 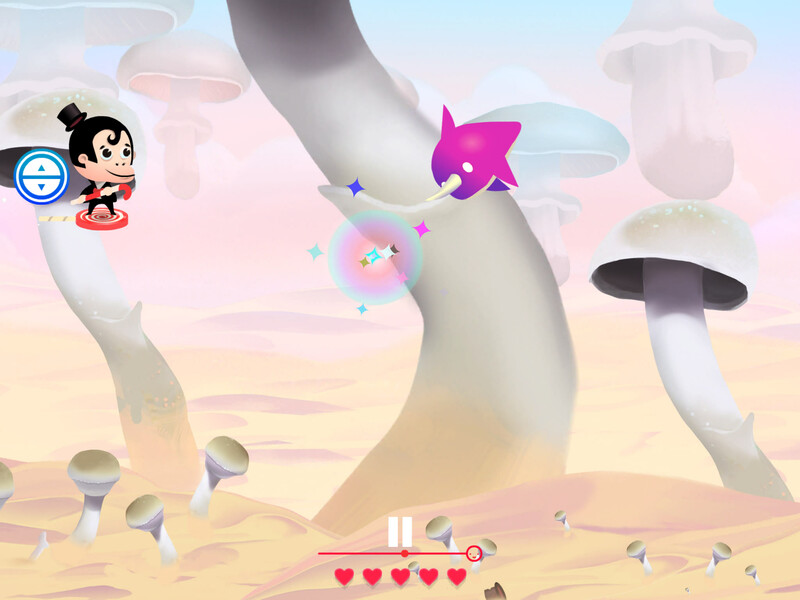 You swipe to move Dandy across the side of the screen and you tap to shoot. Fortunately, the game offers the ability to adjust the swiping sensitivity, which allowed me to move Dandy by using small swipes at the bottom-left corner of my screen rather than have to swipe all the way up and down. Not having to trace the whole height of the iPad to move allowed me to keep my finger from hiding Dandy. Same goes for playing on my iPhone 6; by upping the sensitivity, I was able to move Dandy without hiding the little guy underneath my finger. The one issue I did have with the game was how you almost always see the various types of enemies in pretty much the same order; after a few playthroughs, I could predict the next type of enemy to appear. I would have liked for the enemies to be completely random, even if that meant that some playthroughs would be much harder than others. After all, the power-ups appear randomly too, so some playthroughs are easier than others because of that. Yes, the enemies do appear at random spots on the screen and often in different numbers, but you won’t get any of the little exploding guys for instance until much later in your run. Perhaps, there could be an option to make the game more challenging by having the enemies appear completely randomly. 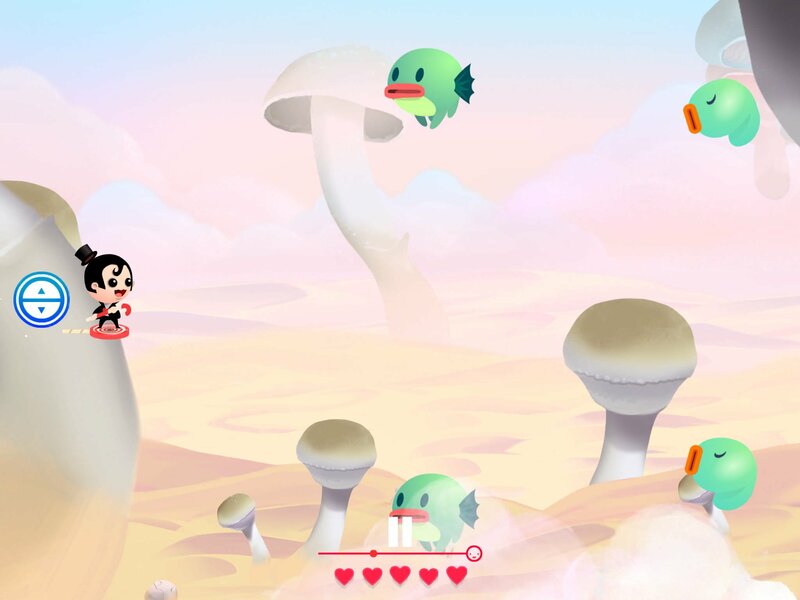 Another small issue was that some of the enemies will often be hidden by some foreground elements at the bottom of the screen (like a mushroom or a cloud), and hit you when you aren’t expecting it. While in the beginning I thought that was a clever idea, after a few playthroughs I found it a bit annoying. Still, these are relatively minor annoyances in what is otherwise a great game that offers iOS gamers a refreshing change from frantic shoot ’em ups. Its wonderful art and music combined with clever gameplay and a great number of power-ups make Dandy the kind of game you’ll pick up and play often. I’m hoping that the developers will continue to support it because simply by adding a few new enemies and a few new power-ups every now and then, Dandy can remain fresh. The game is all premium and hides no IAPs, and you can play on both your iPad and iPhone, although there’s not iCloud save (but I’m not sure you would need that). Wefiends Inc. really did a great job with Dandy, and all the thought and work they put into it resulted in a fresh and clever shoot ’em up that will offer hours of fun.